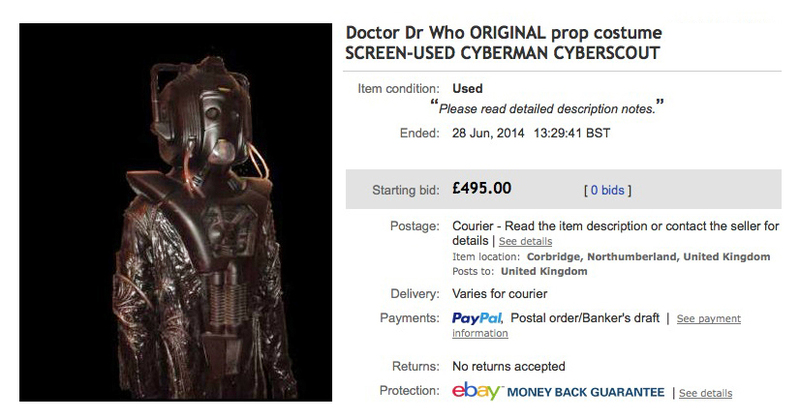 This month on eBay I found a screen-worn Cyberscout costume as used in Attack Of The Cybermen. 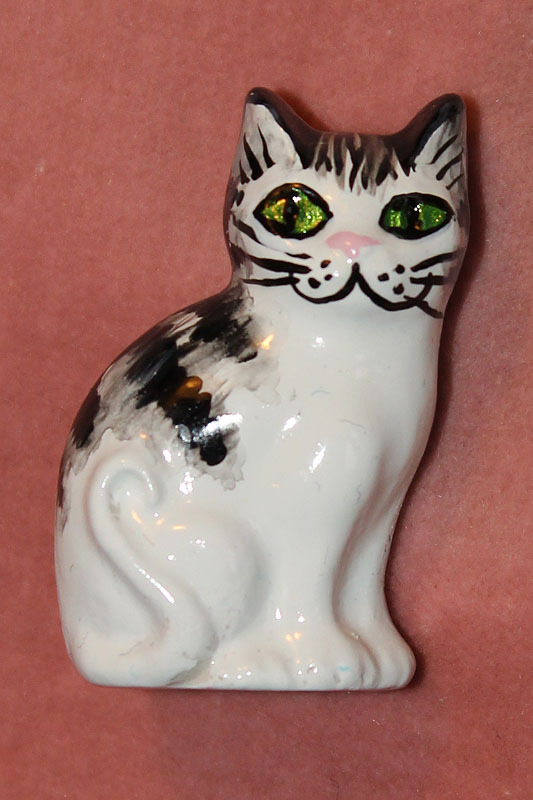 It was purchased in as found condition and has ben restored to make it look a lot more like it appeared in the episode. Nice work. Items like this just do not come along very often! The Cyberscout! Due to a mega life-change (returning to full-time education in my forties and leaving my full-time teaching job---gulp!!! 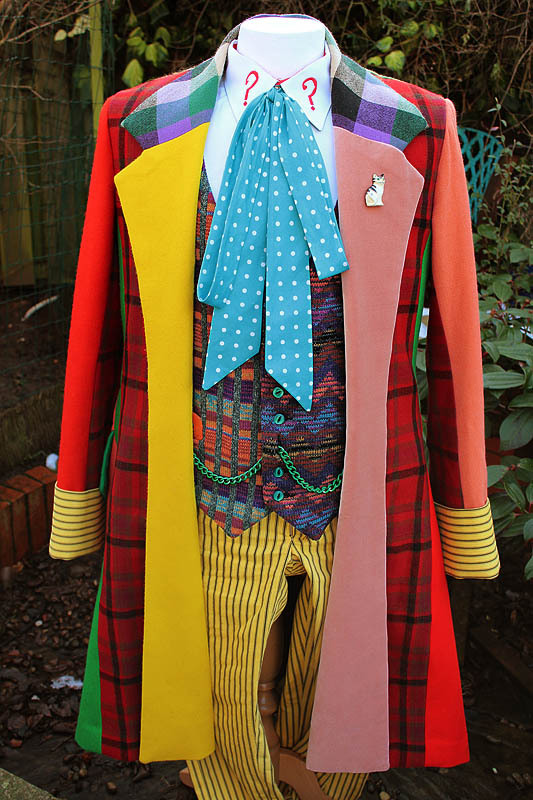 ), I have made the painful decision to sell a few of my most prized Doctor Who original props to help with the transition. Up for auction is a serious opportunity…the surviving, original ‘Cyberscout’ screen-used costume from the 1985 story ‘Attack of the Cybermen’. What makes this particular costume so special and truly unique, is that it is one of only two ‘Cyberscout’ costumes made and the only one surviving (the other was the ‘stunt’ version that was cut up for pyrotechnic work in the sewer scenes). Read on for details… and please check out the images which illustrate the description below. 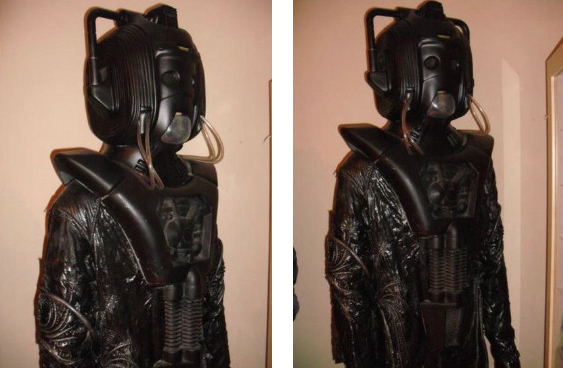 1: Original Cyber-suit (used also in ‘The Five Doctors’ and ‘Earthshock’). This has been placed permanently on a mannequin as the condition I received the costume was worryingly worn! 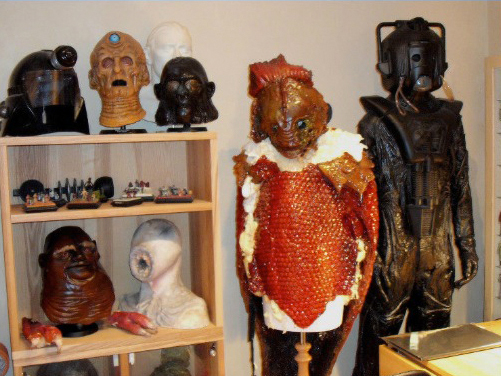 (All Cyber-costumes from the original show have perished latex and paint flaking. If they haven’t they have either been restored or are NOT original). 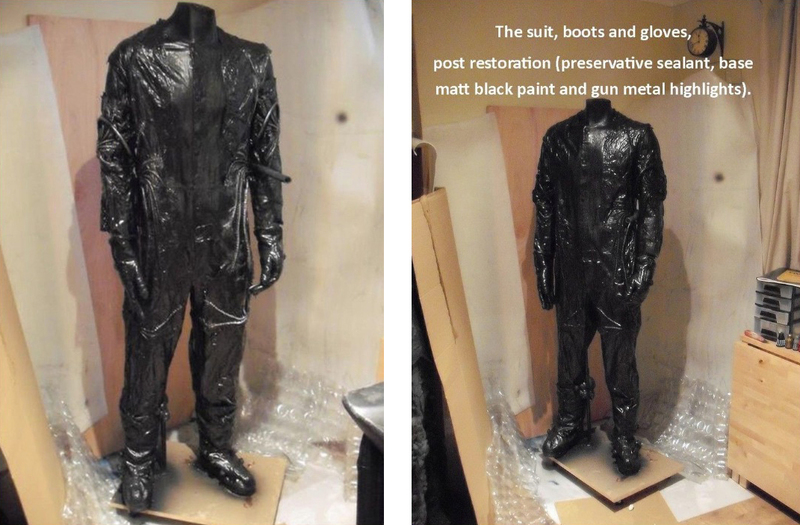 The costume was then treated with a sealant resin to piece the costume back together (like the original latex) although, unlike the latex, this will protect the costume for a VERY longtime (i.e. longer than your life-time! )and will not begin to perish. 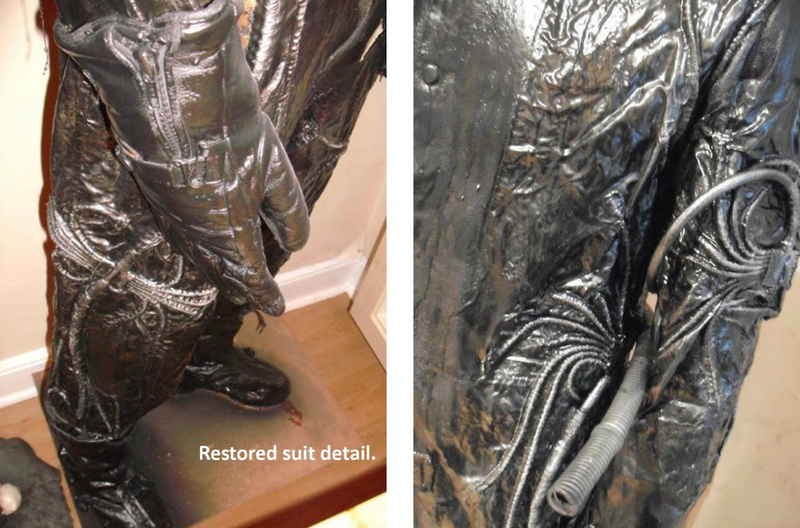 The suit had a top coat of black flaking paint (the ‘Cyberscout’ paint scheme) that was revealing the original silver beneath. 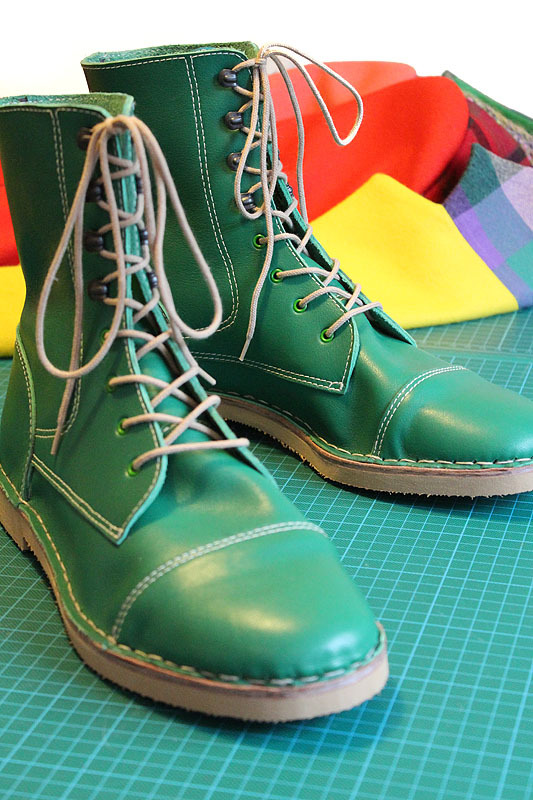 Once the protective coat was applied, I decided the restore the paintwork to its original look. It was carefully sprayed matt black and then by hand with brush, detailed with a dark gun-metal highlighting. 2: Chest piece: this is the original screen-used Cyberscout chest unit, sadly it has lost its perspex front cover. An amazing prop in itself- I did not re-spray this, but left it in its original condition. On the inside of the chest is a plaster name ‘Roger’ which corresponds to the actor who played several of the non-speaking Cybermen from that story. 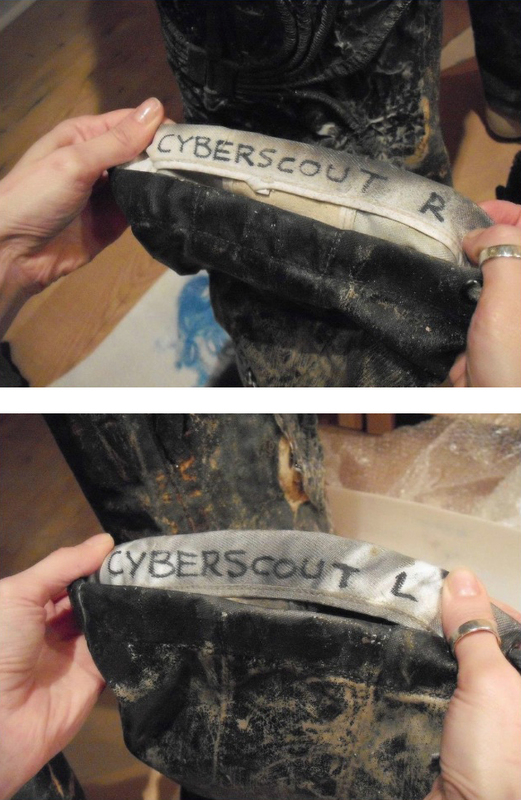 3: Original screen-used Cyberscout boots: marked inside ‘CYBERSOUT L’ & ‘CYBERSOUT R’ repectively. Excellent condition. Again resprayed with the suit to match as again, a lot of the original black paint had come away. 4: Helmet: sadly this is not a screen-used version, but still a great helmet and not merely a ‘fan knock off re-mold’. I bought it directly from Stuart Evans (of SEVANS Models) in the early 1990’s. It was his last direct fibre-glass casting from the original BBC ‘Attack’ mold he had access to. I have paperwork from Stuart that I will include in the auction confirming this. So the helmet came direct from the BBC mold used to make the actual Cyberscout helmet! 5: Gloves: a closely matching, but not original pair of biking gloves, painted to match the rest of the costume. 6: Mannequin: a tall good sized mannequin comes as part of the price (as thee costume is fixed to it!). I ensured that the pose and style of the mannequin was appropriate to the figure. The mannequin is supported on an MDF, castored base. 7: PROVENANCE: The original costume parts come with a COA from the ‘Propstore of London’, where I original viewed and bought the costume. 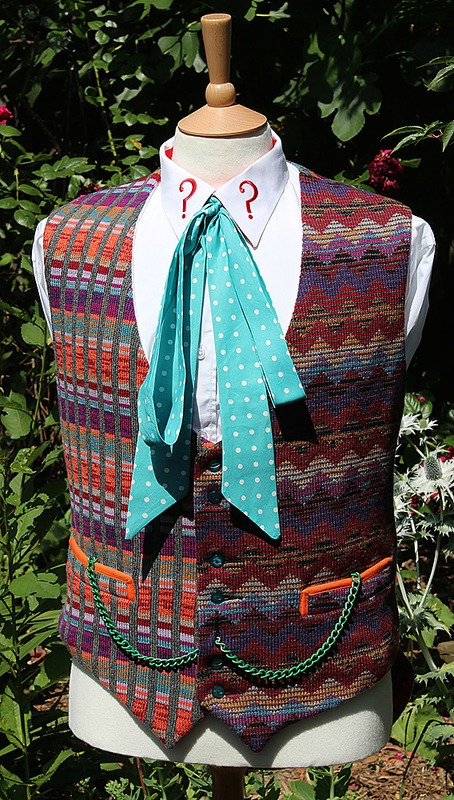 I discussed closely with them where they had obtained the costume (directly from an ex-BBC effect technician). Letter from Stuart Evans re. the helmet will also be included. Please note: this is an old screen-used costume and that while my restoration project on it 'tidied' it up a bit, it was never my intention to 'resculpt' areas as new. As such the costume show areas of wear (although these will not deteriorate further with the addition of the preservative). Please do not bid if you are expecting a 'brand new' item. Apologies for the last point as most of us Who prop collectors know this only too well, but there are the odd one or two to don't!